“That’s it?” Lady Elaryindril asked, bemused. “That is it,” Gåtesbuî the Great solemnly denoted. The trio picked their way through the haze among the rubble of large black stones strewn about the area in front of them. All around them, they heard distant animal cries. If either of the Crater High students wondered which disturbing creature name belonged to which noise, they did not voice it. “What a despicable evil it was for the Wraith Lord to destroy this temple!” Elaryindril said while ducking under a fallen column. Gåtesbuî the Great rounded the broken remnants of a wall. “I believe the Room of Visions was just around here.” As soon as the other two joined their white tunic guide, he pulled out the pellet, eyed it curiously, then tossed it to the ground, where a puff of smoke made the air in front of them shimmer momentarily. Lady Elaryindril cocked her hand, preparing to slap her counterpart on the back of the head, when suddenly a figure blurred into view in front of them. Hovering in the air, an image bent back and forth, as if subject to the whims of a breeze. They all squinted their eyes and scrutinized the scene. Eventually, they recognized a woman standing at the center of the image, her frizzy hair extending in an oval around her face, which was still difficult to make out in the shimmering air. All around the figure they could catch pieces of a setting, which included some form of altar, a book, a hanging fabric. The vision still shimmered as if out of focus, but then a sound accompanied it. The voice warbled, but its meaning could be fairly discerned by those present: “Saye Rünowele da Dertjerack is the ultimate hero … he rescues many in battle against impossible odds … a man who understands his principles from the start and can remain true to his character until the very end regardless of the forces against him … ” The spectators could see the mouth of the Goddess moving, but the words did not all match. It was as if the sound and image were slightly separated and arrived at different times. “M’Illæ Bïcknsn … Emily Dickinsen,” Elaryindril now spoke mechanically. “Woah, Miss Elaryin-girl, don’t go all hypnotic on me. Are you chanting some ancient gnome language or something? What’s going on?” Cyrus Knowles the Quarterback lifted an eyebrow. “Edith Wharton’s The Age of Innocence,” Elaryindril answered, still staring straight ahead. “Look at the book next to the podium,” Lady Elaryindril followed up. “That definitely does not ring a bell … at least not since today,” Cyrus Knowles the Quarterback responded. “Hey, our sorcerer dude’s name. 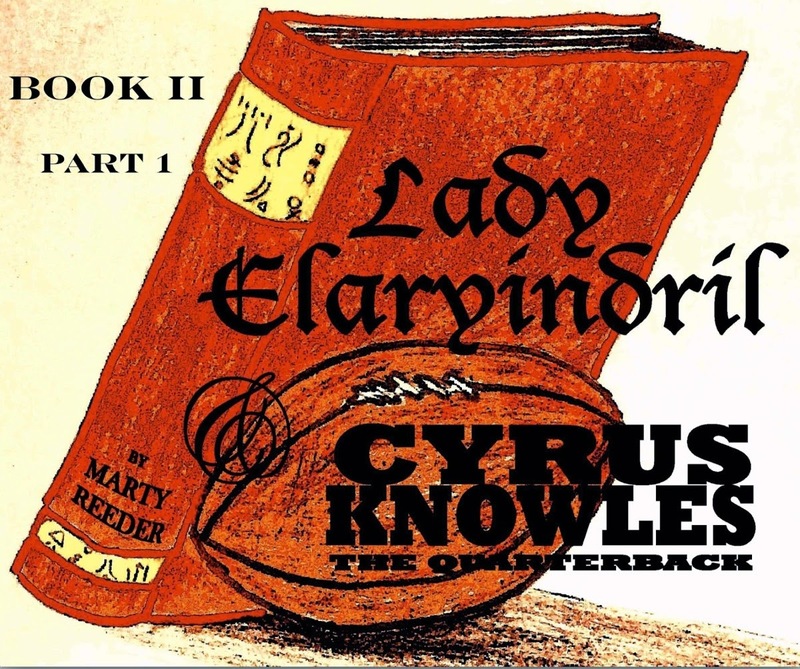 Is that from your fantasy class?” Cyrus Knowles the Quarterback asked. “Adultery?” Cyrus repeated, “That’s what that book was about? Huh, the story finally starts to make some sense.” Elaryindril’s moan after Cyrus’s observation made it clear that he was not helping matters. “What do you mean?” Cyrus asked. The vision before them suddenly flickered and died. Cyrus lifted his eyebrows at her passionate actions, but did not quite know how to respond. Cyrus stood rooted the ground, pondering as he witnessed Elaine stumble over the ground in a huff. While the Crater High quarterback never could have predicted being in such a strange fantasy world, even more unbelievable to him was what he was about to do next.